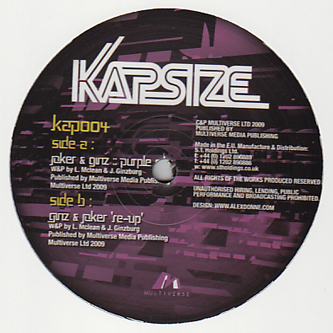 Bristol's finest hooks up with fellow Purple Wow fiend Ginz on a couple of deadly bangers for Kapsize. 'Purple City' has been fairly inescapable on radio and in the dance of late, caned by anyone lucky enough to own a copy. As with all of Joker's releases, it's all about those scorching synthlines and this one's strong enough to take yer eyebrows off if you're not careful. We don't know anyone else who can pack as much squealing funk into their tracks right now and this is just sick! 'Re Up' on the flip pits the pair into a slightly different scenario, working around a post-jungle and grime styled riddim, bucking and churning with the flex of its predecessors but forming an entriely original and new style that f**king with our heads right now. This sounds like jungle, grime, R'n'B and dubstep compressed into one seething ball of dancefloor pressure and we love it. Massive twelve - GET IN!! !